Please Call 1-800-759-6960 for assistance. We are in your area! We strive to help every client, regardless of your geographical location. Bio-Trauma 911, Inc. works with biohazard remediation companies throughout the United States. Through this partnership, we may be able to provide Crime & Trauma Scene Remediation Services to businesses and residents of the State of Ohio. If you are located in any of the following or surrounding cities, please contact us at 1-800-759-6960 to see if we have technicians in your area. Before you contact any other company, please read the "Cost of Services" block. The staff at Bio-Trauma 911, Inc. is here to assist you in any way possible. Even if you choose not to use our services, we would like to discuss with you the various options you may have to remediate your crime, trauma or hoarding scene. Bio-Trauma 911, Inc. will always provide a written estimate of the work to be done with an estimate of the overall costs. While this seems to be a common sense approach, many companies will simply tell you that there is no way to estimate the cost of the job and will assure you the final cost will be "reasonable". Only after you've signed a contract and all of the work has been completed will you discover that the total cost incurred by you and your insurance company is much more than it should have been. Our staff is routinely called to complete price comparisons for agencies who are fighting inflated charges. The staff of Bio-Trauma 911, Inc. is here to assist you. If you have not yet contacted us, please do so before signing a contract with any other company. Even if you decide against using our services, our knowledgeable and helpful staff can still help you to negotiate a fair price for the job at hand. Call our toll free number at 1-800-759-6960 and ask for Martha Lenz or Steve Hanna. You will never be charged for asking for our advice. Bio-Trauma 911, Inc. offers a wide variety of services to both individuals and companies throughout Ohio and most of the United States. Available 24 hours a day, seven days a week, our technicians offer our clients a viable means of relieving some of the pain and anguish suffered as a result of a traumatic event. Technicians employed by Bio-Trauma 911, Inc. have received extensive training in crime scene cleanup, suicide cleanup, odor removal, remediation following an unattended death and the removal of personal effects and waste resulting from gross filth and hoarding. Although a visual inspection of a crime or trauma scene may reveal a great deal of blood and bodily fluids about the area, an equal amount will be found by our technicians in areas that cannot be seen or easily accessed. It is vital that all traces of these elements be removed from a scene, whether a crime has been committed or not. In conjunction with specialized training in the detection and removal of infectious waste and biohazard materials, our technicians will restore your house or place of business to a safe environment. Before you attempt to clean a crime or trauma scene, please speak with a trained & certified technician. We have trained personnel standing by 24 hours a day to answer your questions. Our technicians are typically dispatched within an hour or two of receiving your call, or at a time that is convenient for you. Bio-Trauma 911, Inc. works with many different insurance companies and are often able to bill your insurance company directly. If insurance covers the cost of our services, the only payment required from you will be your policy deductible. If insurance coverage is not available, we do offer several different payment plans, which generally suit most budgets. Since 1995, the caring and compassionate staff of Bio-Trauma 911, Inc. has been insturmental in helping hundreds of hoarders throughout the Midwestern United States. With an office located in the State of Ohio, Bio-Trauma 911 can offer you or your family member(s) professional and cost effective hoarding cleanup services. Our staff understands that compulsive hoarding is a condition and that it does not define the person. We understand that hoarding comes in all shapes and sizes and nothing it too big for our team to handle. We further understand that the one who hoards is often times a very successful person and well-respected in his or her community. All of this we understand and we will respect you, regardless of this condition. We will treat you and your family with the utmost professionalism and dedication and our interaction with you will remain discreet and confidential. While many companies exist to help you through the cleanup and removal process, Bio-Trauma 911 is one of the few who will take time to sort and organize while we clean. This attention to detail is vital, as many valuables, keepsakes and sensitive documents may be found during the cleanup process. The last thing we want is for these items to end up in the trash. During the cleanup of a hoarding scene (also referred to as clutter clean up), our staff will work with you and your family. We will take the time to understand what should and shouldn't be discarded. Those items to be kept may be boxed up and stored until the entire remediation process has been completed. And, following the removal and sorting of your personal effects and based on your request, our team will conduct either a basic or comprehensive cleaning of the entire house. 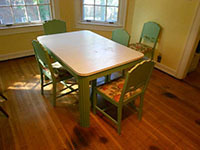 Our "Green Clean" residential cleaning service is a popular addition to our compulsive hoarding cleanup services. If you are looking for help with hoarding, filth, clutter or any of our other services offered below, please call Bio-Trauma 911 at 1-800-759-6960 and ask for Martha Lenz or Steve Hanna. Even if you're not ready to begin the cleanup process, feel free to call us for advice and information. 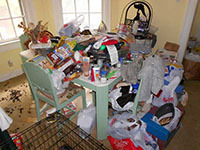 Our hoarding and clutter cleaning services are offered to residents in and around the following cities: Columbus, Cleveland, Cincinnati, Toledo, Akron, Dayton, Parma, Canton, Youngstown, Lorain, Hamilton, Springfield, Kettering, Elyria, Lakewood, Cuyahoga Falls, Euclid, Middletown, Mansfield and Newark. Please feel free to call us at 1-800-759-6960 to see if we service your area. Bio-Trauma 911, Inc. is the premier Crime & Trauma Scene Cleanup Company in the United States of America. Our staff provides a level of service that routinely exceeds our clients' expectations. In addition to the compassionate, caring and cost-effective services we offer, Bio-Trauma 911, Inc. is also the leading Crime & Trauma Scene Cleanup Training Center in the United States. A vast majority of the owners and staff of new companies in operation today were trained by our skilled and knowledgeable instructors. Our staff is committed to completing each job with the highest degree of integrity, honesty and professionalism. We make you this promise! If for any reason you are unhappy or dissatisfied with the work or service you receive from Bio-Trauma 911, Inc., and we find your concern legitimate, we will make every effort at our expense to rectify the situation. We make you this promise! Bio-Trauma 911, Inc. opened its doors in 2005. Since that time our staff has continued to refine, redevelop and improve the heartfelt and compassionate services we offer to families, friends and loved ones of those injured or deceased. The praise and thanks given to the staff of Bio-Trauma 911, Inc. is a true indicator of our continued success as a crime scene cleanup company. Whether you're faced with cleaning the remains of a traumatic death, a suicide or accident scene, our staff is here for you. If you have a family member or friend in need of help because of a gross filth or hoarding problem, our staff is here for you. If you just need to talk, our staff is here for you.